The Series That Makes Kid’s Stories Into Movies!! Time travel to a world ruled by dust bunnies. Discover a place where phantom wheelie bins have amazing powers. Witness a magic freeze spell. Consider the possibility of Martians living here on earth. Cheer on the Phantom Avenger. It’s wacky, weird, and absolutely wondrous one-of-a-kind entertainment. It’s the most unique television series on the face of the planet. It’s Incredible Story Studio, and on this show, anything can happen! Created by kids, it’s kid’s TV of the first degree. 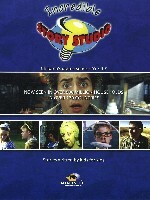 Incredible Story Studio is the children’s series that makes kid’s stories from around the world into movies! Hosted by The Studio Boss (Camille Devine), a comical kid with mega moxie, each half-hour episode features the original stories of 10 to 14 year old writers. The kid writers introduce their own stories, which are adapted into 10 minute live action dramas, and are profiled on the show. And in true “Old Hollywood” style, kid actors are showcased as stars in the making, adding pomp and pizzazz to every show. Incredible Story Studio is one of the world’s most popular kid’s programs – now seen in over 400 million households! Vérité Films and Minds Eye Entertainment teamed up with Merlin Films Group of Ireland to produce seasons four and five as international treaty co-productions. Children’s stories from the UK and Germany were filmed in Galway Ireland, while stories written by French and Canadian kids were filmed in Regina, Saskatchewan.